This loveable New on Tags autumn/Winter three piece Scooter Skirt set is from B.T. Children. The long arm top features lace accents with an cringle design and is completed with the loveable bloomed fabric print trim. The Scooter Skirt is a blue jean with an flexible back and mock front fly for comfortable wear. The Scooter Skirt completes with the two tiers of the same bloomed chiffon fabric. The pink attached shorts give this Scooter Skirt additional comfort. 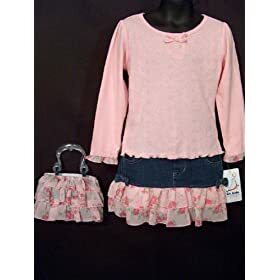 The Purse is a blue jean with three tiers of the bloomed fabric all around the purse to complete the outfit. Simply adorable for the season.